This relatively new breed of pony was developed primarily as a show horse for gaited competition. Although it has three unique gaits, it is able to compete in seven. As a result of its Welsh pony heritage, the pony also makes a good light hunter. Standing up to 14 hands high, the American Walking pony is a relatively large pony-type. It has a clean, smallish head on a well arched and muscled neck. The back is short, the shoulder is slightly sloped, and the hips are well muscled. 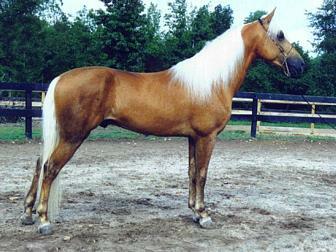 The pony is essentially a cross between the Tennessee Walking Horse and the Welsh Pony. The American Walking Pony Registry, established in 1968, regulates the breed by allowing only horses that have been registered with both the Walking Horse and Welsh Pony registries (or with some cross between the two) to be made available for stud. The three gaits unique to the American Walking Pony are the Pleasure Walk, the Merry Walk, and the canter. Both the Pleasure Walk and the Merry Walk are four-beat gaits that are faster than a regular walk (the Merry Walk being the faster of the two), and are described as being light and free.